In 1621 the Pilgrims celebrated their first Thanksgiving, offering thanks to their Creator for the blessings that helped them survive their first winter in the new world. 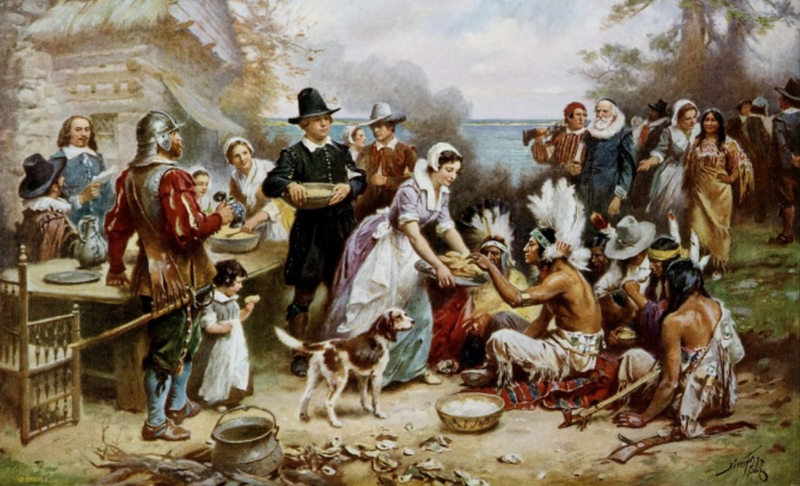 When the pilgrims arrived on the Mayflower in November 1620, 102 people were on board. By the Fall of 1621, only 53 had survived, but of these 53 survivors, they took time out to give thanks. Their collective vow built a bond among them that held fast through difficult times. The vow carried them through the greatest of hardships to build a colony in America that helped to shape an American identity and establish us as a nation committed to a higher purpose. Their vision, even though tarnished and twisted over time, has inspired millions of Americans and will continue to do so. My gratitude and thankfulness is to those Pilgrims and Puritans who came before us, not as conquistadors but as people dedicated to a higher purpose, who worked diligently to fulfill their sacred vows, and through it all, helped change the world forevermore.